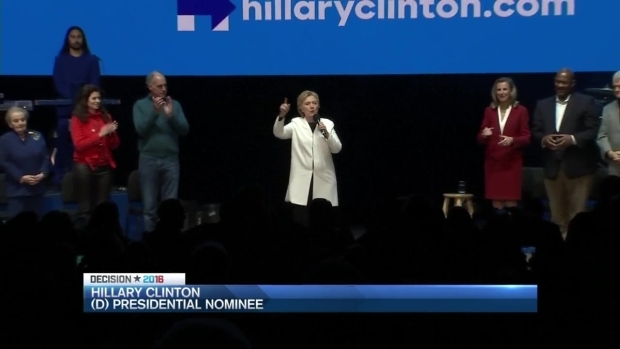 With just two days to go until Election Day, Democratic presidential nominee Hillary Clinton campaigned in Manchester, New Hampshire, on Sunday. Clinton spoke at 8:15 p.m. at the Radisson Hotel. She was introduced by Khizr Khan, the Muslim-American father of a slain Gold Star solider and folk singer James Taylor. Clinton said the country is facing a "moment of reckoning" on Election Day, and Americans must choose between "division and unity." 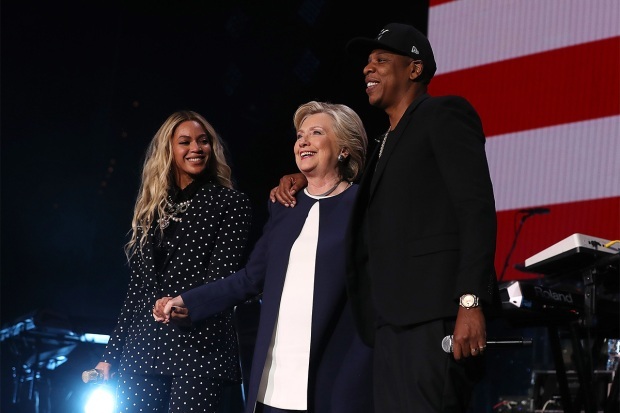 Clinton is closing out the final hours of her presidential campaign with a more positive message focused on uniting the country, as she appeals to Americans of all political affiliations. The Democratic presidential candidate says she is "hopeful and optimistic" about the future. 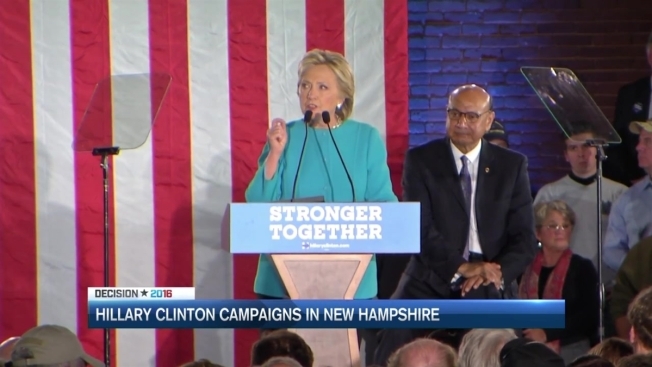 Democratic presidential candidate Hillary Clinton will speaking at a rally Sunday evening at a hotel in Manchester, New Hampshire. She said: "We have to heal this country." President Barack Obama will campaign for Clinton on Monday in Durham. Republican presidential nominee Donald Trump will campaign in Manchester, New Hampshire on Monday with running mate Mike Pence. Pence was also campaigning in the state on Sunday. Trump spoke at a rally in Atkinson, New Hampshire on Friday, saying that whoever wins New Hampshire on Tuesday night will win the election. New Hampshire's gone for Democrats in every presidential race since 2004. But a trio of polls released Thursday showed Clinton and Trump virtually tied in the state. Nearly all earlier polls in New Hampshire throughout the campaign showed a Clinton lead. New Hampshire Secretary of State Bill Gardner predicts a record turnout of 738,000 voters. Top aides at Clinton headquarters believe New Hampshire's large makeup of independent voters - about a third of the electorate - can be swayed by late breaking news as much as by turnout efforts. The Trump campaign sees recent news of the FBI investigating new emails potentially related to Clinton as a development in its favor. That adds to the Clinton team's worries of voters suffering from a primary "hangover" in states like New Hampshire and Iowa. Clinton faced attacks in both states from rival Bernie Sanders - who won New Hampshire - and more than a dozen Republicans dating back to early 2015. The buildup of those attacks, the campaign believes, continues to resonate with voters. New Hampshire remains one of Clinton's toeholds to block Trump's path to 270. Trump, meanwhile, would need to win New Hampshire as well as the toss-up states of Florida, Iowa, Nevada, North Carolina, Ohio and single congressional districts in Maine and Nebraska to capture the presidency. Trump says a New Hampshire victory is within reach. Republicans say they have 300 paid staffers on the ground in the state for the final get-out-the-vote push. Democrats, meanwhile, say they have more than 100 staffers on the ground to turn out the vote. Clinton's strategy in the closing days of the campaign has been to paint a grim picture of life in America for minorities under a Trump presidency, an approach aimed at motivating blacks and Hispanics. But that strategy is less effective in a state like New Hampshire, where the electorate is overwhelmingly white. And of New Hampshire's 919,000 registered voters, more than one-third aren't affiliated with a political party, according to early October numbers. Democrats make up 271,000 and Republicans make up 295,000. That doesn't include voters who will register on Election Day. In some areas, Democrats say they're still seeing a lack of enthusiasm for Clinton among Sanders supporters. Clinton handily lost the primary contest to Sanders, while Trump easily won the New Hampshire primary against roughly a dozen opponents.